Intercept 8500 LPP is AkzoNobel’s highest-performing biocidal antifouling, revolutionizing the market thanks to the linear polishing performance afforded by its unique combination of Lubyon® and silyl methacrylate technologies. *Calculated over a five year cycle using Intercept 8500 LPP compared with a high volume, high performance self-polishing copolymer (SPC) coating. range of fouling control options to suit each vessel’s operating profile and trading route. “At the same time, our industry remains under pressure to increase operational, cost and environmental efficiencies. 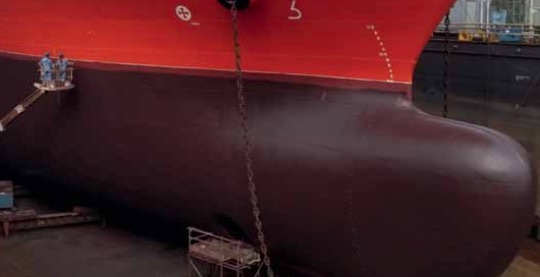 Ship owners and operators understand the value of choosing a coating with the capability to deliver long-term consistent fouling control throughout the dry docking cycle, which supports overall business profitability and compliance with increasingly stringent environmental regulations,” Barnes said. One recent adopter of Intercept 8500 LPP is Sea Light Shipping & Offshore Co Inc (SLS), a leading Dubai- based owner and operator of cargo ships, bulk carriers, multi-purpose and offshore vessels. patterns of individual vessels. The range has been incorporated into AkzoNobel’s industry-first Big Data consultancy technology, Intertrac Vision, which ship owners can access via specially trained Intertrac Vision consultants to gain an accurate picture of the performance of Intercept coatings on their vessels over the full dry docking cycle, prior to application. AkzoNobel creates everyday essentials to make people’s lives more liveable and inspiring. As a major global paints and coatings company and a major producer of speciality chemicals, it supplies essential ingredients, essential protection and essential colour to industries and consumers worldwide. Backed by a pioneering heritage, the company’s innovative products and sustainable technologies are designed to meet the growing demands of a fast- changing planet, while making life easier. Headquartered in Amsterdam, the Netherlands, it has approximately 46,000 people in around 80 countries, while its portfolio includes well-known brands such as Dulux, Sikkens, International, Interpon and Eka. Consistently ranked as a leader in sustainability, AkzoNobel is dedicated to energizing cities and communities all while creating a protected, colourful world where life is improved by what it does.